MYANMAR GETS 02 HOURS FOR "COUNTRY SECRET LAW". 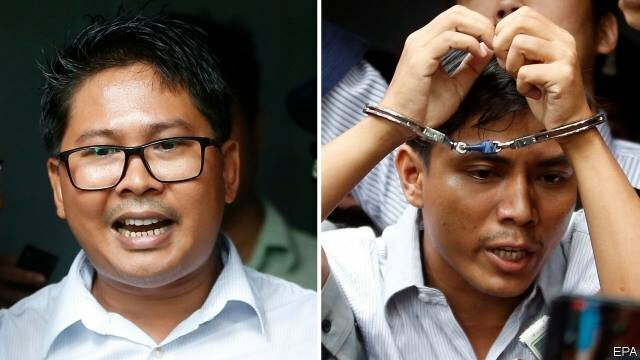 The administration of Aung San Suu Kyi, a US-backed Democratic leader, has sentenced two Burmese journalists from Reuters. Specifically, 01 week after a group of UN investigators said senior Burmese generals should be tried for the Rohingya genocide in the western state of Rakhine, a Yangon magistrate A seven-year prison sentence for two Burmese journalists working for Reuters has investigated the murders of Rohingya found in a mass grave. The name of the reporter, the judge read, was found in the possession of confidential documents that the Government has prescribed. This, according to the judge, is a violation of Burma's secret secretariat. In fact, the journalists, Wa Lone and Kyaw Soe Oo, did not steal the documents. The papers were assigned to them by the Police officers during dinner. Reporters were arrested when leaving the restaurant. A spokesman for the ruling party, the Democratic League for Democracy, was also a close friend of Aung San Suu Kyi, the "real" leader of Myanmar, who said she thought the two journalists was deliberately "fabricated" and bribed the police to have documents. Because Suu Kyi's civil authorities have no control over the armed forces or the police to direct them to do so. But then Burma's President, Htin Kyaw, another close friend, allowed the police to investigate the case. The conviction ended a nine-month trial. A witness had to read the notes written on hand so as not to forget the location where these two journalists were arrested. A police officer did not appear in the courtroom to testify. The judge fell ill. A police captain told the court that journalists were actually framed. He was quickly detained and dismissed. No one denies the massacre that journalists are considering - even the military, acknowledging its responsibility and claiming to have jailed seven soldiers for their involvement. But a few days later, Myanmar's public television station said the soldiers were free again. When the foreign press holds the story of the release of a spokesman for the government, it dismisses it as "false news." So, a US-backed Democratic regime after taking power has ... jailed Western journalists, because they unmasked the Burmese military. P / s: Previously, "Democratic Vietnam" usually brought Myanmar and Philippine compared to Vietnam ... Now that they have been through these two countries have not been 03 days, the prisoners also shot dead! Hi @toanls, you have received an upvote. I'm the Vietnamese Community bot developed by witness @quochuy and powered by community SP delegations.